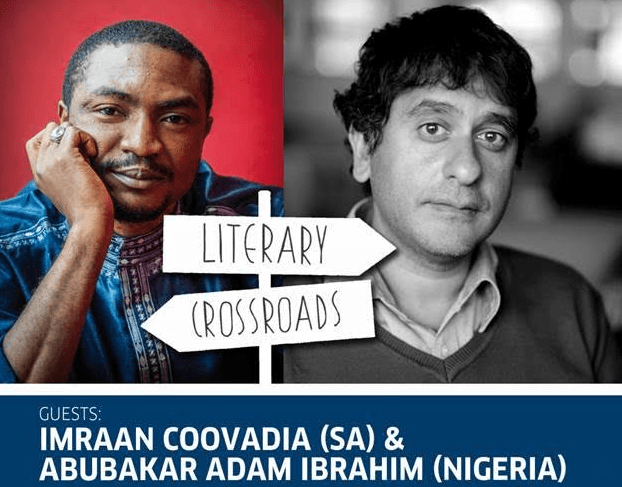 Imraan Coovadia and Abubakar Adam Ibrahim will be at the Goethe-Institut in Johannesburg for a Literary Crossroads conversation on 16 May. The topic of the conversation is: The course of history and its inflicted casualties: The struggle of the individual for autonomy & survival and its depiction in contemporary African literature. The session will be moderated by Danjela Demir. Imraan Coovadia is a writer and director of the creative writing programme at UCT. His most recent novel is Tales of the Metric System (2014), which appeared in the US, South Africa, India, and Germany. He is the author The Institute for Taxi Poetry (2012), winner of the M-Net Prize, and a collection of essays, Transformations (2012), which won the South African Literary Award for Creative Non-Fiction. In 2010 his novel High Low In-between won the Sunday Times Fiction Prize and the University of Johannesburg prize. He has published a scholarly monograph with Palgrave, Authority and Authorship in V.S. Naipaul (2009), two earlier novels, and a number of journal articles. His fiction has been published in a number of countries, and he has written for many newspapers, journals, and magazines here and overseas, including the New York Times, N+1, Agni, the Times of India, and Threepenny Review. Literary Crossroads is a series of talks where South African writers meet colleagues from all over the continent and from the African diaspora to discuss trends, topics and themes prevalent in their literatures today. The series is curated by Indra Wussow and Sine Buthelezi. Access the Facebook event of this Literary Crossroads edition here and join the conversation on Twitter and Instagram via #LiteraryCrossroads.